Spacious living has never looked so good. 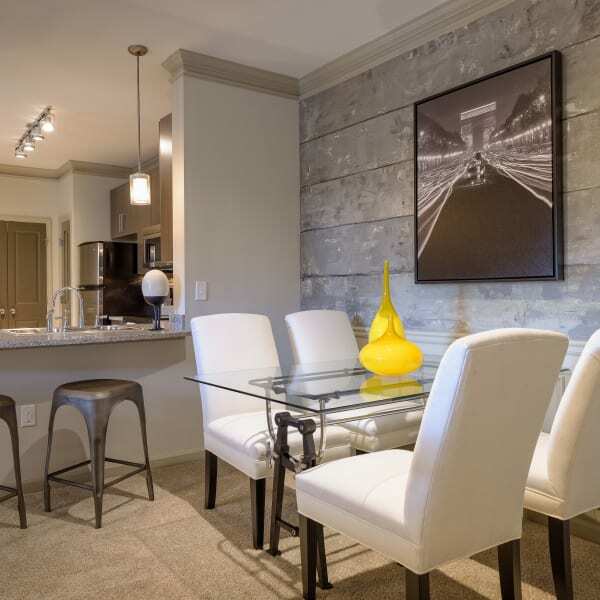 At Provenza at Old Peachtree in Suwanee, Georgia, you’ll have your choice of luxury one, two, and three bedroom apartments that are designed for easy, carefree living. Our one bedroom apartments start at a spacious 694 square feet. The two bedroom apartments are the perfect choice for those who are sharing their space. Our largest option at Provenza at Old Peachtree is the three bedroom apartments which come in at a roomy 1,314 square feet. No matter which floor plan you choose as your best fit, you will find the same attention to detail in every home. Sweeping 9-foot ceilings are paired with double crown molding for an elegant and stylish touch. Hardwood-style flooring is not only easy to clean but also adds a warm and modern aesthetic. And no Suwanee home would be complete without an outside area to call your own, which is why you’ll find that every one, two, and three bedroom apartment at Suwanee comes with a private balcony to enjoy a balmy evening alfresco. Now that you’ve found your perfect floor plan, come see it in person! Contact our friendly team today to set up a personalized tour of our Suwanee, Georgia, community.